You never know when you'll come across a recipe worth keeping. Aside from cookbooks, websites or magazine, recipes could be from a friend, family member, coworker, or even a random stranger at a grocery store. My friend Suzanne came across this recipe for Korean Bulgogi through a family member's co-worker's wife. After a few of her own tweaks to the recipe, it's definitely a keeper. A blend of ingredients transformed strings of beef into tender, flavorful bulgogi and there's no reason to change this recipe. It's absolutely perfect! If you're a fan of Korean cuisine or even if you haven't really tried Korean food, this is a recipe that will please bulgogi fans and create new ones. 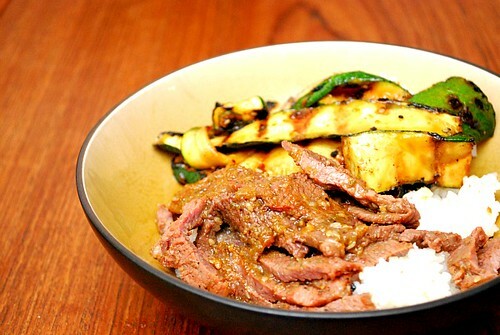 Bulgogi is a Korean dish of thinly sliced marinated beef, chicken or pork that's grilled. I've tried various kinds of bulgogi recipes calling for pear nectar, pineapple juice, spicy chili paste and all sorts of different ingredients. Suzanne's recipe below doesn't call for anything out of the ordinary which makes it even more appealing. Everything is whizzed up in a blender, poured over the beef (or your choice of meat) and allowed to marinate overnight to absorb all that flavor. The only thing left to do is grill the meat and you're set! We enjoyed this over steamed sushi rice and grilled zucchini slices. If you're gluten free, simply substitute the soy sauce called for in the recipe with tamari. Place the beef in a shallow baking dish or gallon sized storage bag. Add remaining ingredients except in a blender and puree to create the marinade. Reserve 1/2 cup of marinade for serving. Pour the remaining marinade over the beef in the baking dish or in the storage bag. Cover the dish/seal the storage bag and refrigerate for at least 8 hours or overnight. Preheat a grill. Remove the beef from the marinade and cook on a hot grill for 4-6 minutes on both sides. Serve over rice and with reserved marinade. I LOVE bulgogi -- thank you for posting this! I've never made my own marinade and can't wait to try this out!